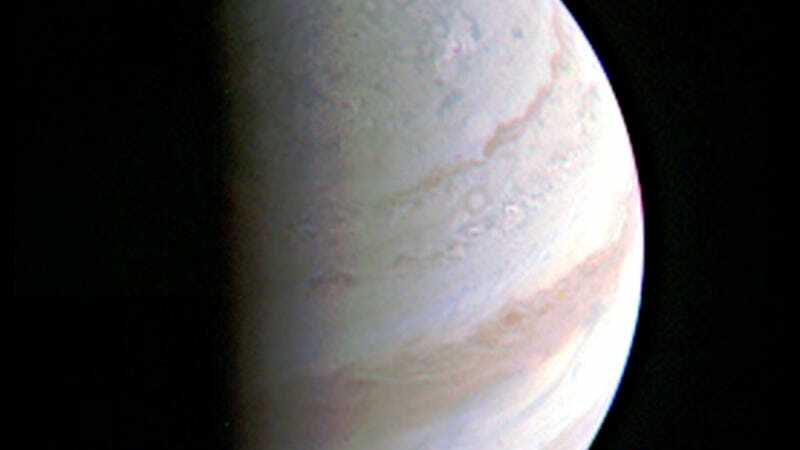 We’ve never seen Jupiter quite like this. NASA’s Juno spacecraft flew closer to the giant planet than any spacecraft ever, revealing stunning images and gathering detailed information about the planet for NASA scientists. The record-breaking mission was launched five years ago, and the spacecraft has travelled 1.8 billion miles to reach Jupiter’s orbit. Juno’s journey wasn’t a straight shot, either. It flew around the inner solar system and used Earth’s gravity to slingshot it toward Jupiter. In its greatest moment, Juno flew about 2,600 miles above Jupiter’s swirling clouds—closer than any spacecraft has ever flown near the dangerous planet. The feat was extremely difficult to coordinate. To put that in perspective, it is roughly the same distance between New York and Los Angeles. Juno’s daring mission was further complicated by Jupiter’s radiation belts. The spacecraft is loaded with a suite of instruments scientists can use to measure different elements of the planet. The instruments can be used to measure Jupiter’s composition, gravity, magnetic field, and the source of its 384 mile-per-hour winds. The spacecraft’s instruments had to be turned off when it first entered Jupiter’s orbit on July 4th to avoid complications caused by planet’s radiation belts. In its record-breaking approach, Juno completed just one of its scheduled 36 orbital flybys. NASA plans to release even more detailed photos of Jupiter’s north and south poles at later date. Given the millions of miles between Earth and Jupiter, it will take days for those images to be downloaded to mission control. Scientists around the world are anxiously waiting to see what the spacecraft digs up. There is also some unusual cargo aboard the spacecraft. Titanium Lego models of Galileo Galilei, the goddess Juno and her husband, Jupiter were included inside the spacecraft along with a plaque dedicated to Galileo. Unfortunately, the Lego figures may never return home.